The annual Citrix Conference, Synergy, is rapidly approaching and people are starting to make their travel plans. If you’re like me, an independent consultant responsible for his own travel expenses, or even an employer looking to minimise your staffs travel costs, this post is for you! I also have details of a discount hotel booking specially negotiated for Synergy delegates! To get the cheapest deal on International flights always include a Saturday night stay in your trip. Use tools like Matrix, SkyScanner , Google Flights etc to find the cheapest routes. If you can be flexible in your routing, and don’t mind multi-leg trips you can often save a great deal over more expensive direct flights. If you’re happy to sacrifice the often-mediocre plane food, I’ve found some great fares by Canadian budget airline WestJet. If you have accumulated some airline miles, consider using these, especially if they have an expiry date. Generally sitting in conference rooms for the week means I don’t need a car, but if you do usually rent a car, use one of the many comparison websites to find a cheap provider. Before you book via the link on the comparison website, sign up for that providers loyalty scheme and book directly. This can often reduce the price even further. When you have booked your reservation, submit the details to autoslash – they track the price and every time I’ve used them have managed to reduce the price significantly before my actual pick up date. The Synergy venue hotel is The Vanetian/Palazzo and as this is an all-suite hotel, four nights during Synergy would set you back a whopping $1093, even at the discounted Synergy rate by the time you’ve included the $25-per night compulsory resort fee. 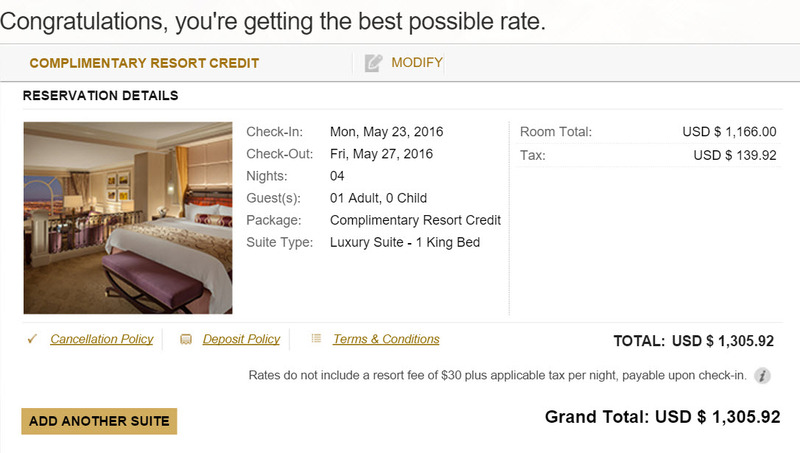 Booking directly is $1305+$32 resort fee so around $1425 for four nights. 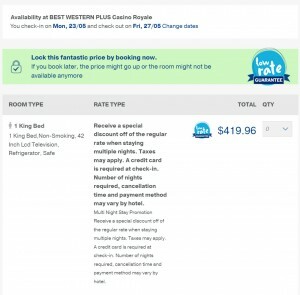 In this case, the conference rate does work out cheaper than booking directly, although is subject to room availability (which I’m told is very tight), plus does have a slightly lower resort fee. 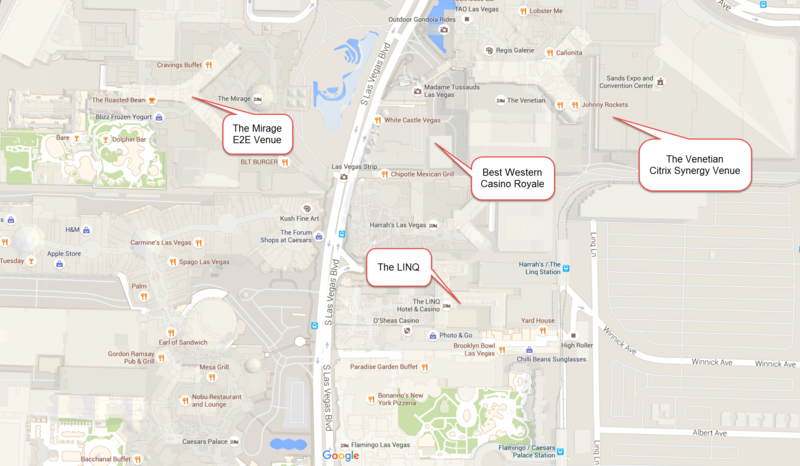 Map of nearby hotels. Click for larger version. You can get four nights here during Synergy for around $420 – plus there is NO daily resort fee! Tripadvisor reviews are mostly positive too. This was refurbished entirely in October 2014 so all the rooms are very modern. See their Tripadvisor page for reviews, photos etc. 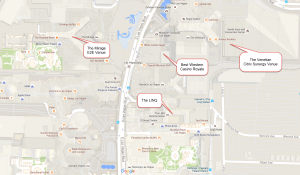 I stayed here for Summit 2015 and it’s about 15 minutes walk from the Venetian. Don’t pay for expensive hotel breakfasts. Breakfast is provided at the convention centre on conference days. On non-conference days, you can get a decent breakfast in many of the food outlets that line The Strip. 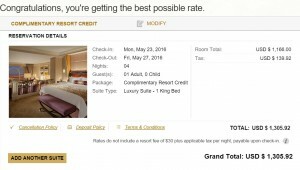 Beware of hidden resort fees – these are becoming a popular “stealth tax” allowing hoteliers to charge more pre-night but keep their advertised rates low by splitting out the charge for internet, sport facilities etc into a daily “resort fee”. The standard resort fee at the Venetian is an incredible $30 a day! Rip-off! For hotels that charge for in-room WiFi, check if they have a free WiFi service in communal areas and the lobby. If your room is nearby you can perhaps avoid paying. Many hotel chain loyalty schemes now offer free WiFi when you are a member, and membership to the basic tier is usually free of charge. Check out my How to get free stuff in Vegas article on building up reward credit before you go to get free food, drink and casino play whilst you are there. There are many budget hotels on and off the Vegas strip. 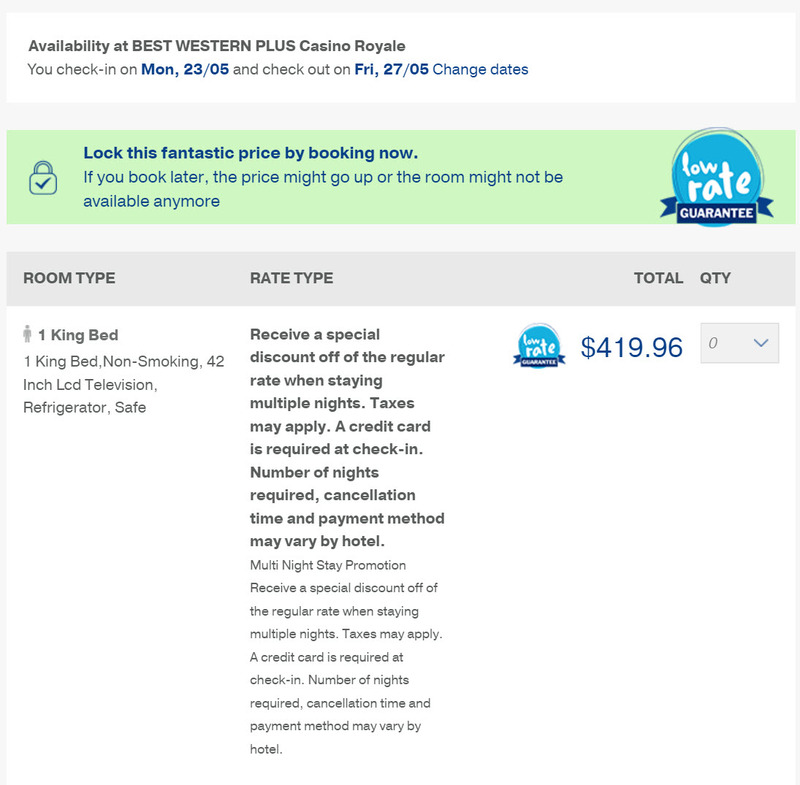 If you don’t fancy my suggestions above, and don’t mind travelling a bit further to save even more cash, choose a hotel near the monorail where you can get an unlimited three day pass for $28 – you’ll easily cover this by avoiding just one day’s resort tax at the Venue hotel! Avoid expensive taxis and use a Shared Ride shuttle from the Airport to the hotel. SuperShuttle charge just $11 each way from Las Vegas Airport to most strip hotels. As Synergy approaches, keep an eye for my regularly updated Ultimate Synergy Survival Guide for more essential tips on the conference.